One of our early food influencers was the late French chef, Jean Banchet, whose restaurant in Wheeling, Illinois was a destination for serious foodies the world over. In the days we visited, during the last decade of Le Français, the way in which his menu was unique was his approach to showcasing foods in different ways—all on one plate. Whether you wanted beef, chicken, foie gras, lamb, pork or seafood, he divided the portion and served it in different expressions, varying the technique, sauce, cut or other component. The potential variations were vast. You could order the lamb, say, at three different visits, and never have the same combination. This was, and still is, our kind of eating. As we don’t have a brigade de cuisine, we typically prepare a much simpler presentation: the protein, simply cooked (grilled, poached, whatever), served with different garnishes or sauces. 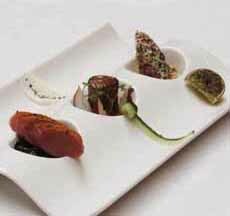 You don’t need a special plate with different sections: Banchet use his regular porcelain dinner plates, as do we. You can take this approach with any course: Who would turn down cheesecake with three different toppings; or pound cake with custard sauce, caramel sauce and fudge sauce? The benefit of this approach is you don’t have to decide: Enjoy three favorites at once. Depending on time and inclination, you can make this as simple or varied as you like. Make one conventional, one spicy and one on the sweeter side (e.g., with fruit). Vary the colors, and as appropriate, the textures. If you’re really ambitious, vary the cooking technique (see below). It can be as simple as three salsas—red, green and corn or fruit salsa; or a similar treatment with barbecue sauce—fruit, smoky and spicy. If you’re a devoted saucier, try three mother sauces or secondary sauces from classic French cuisine. Or, go international, with sauces and garnishes from, say, Asia, Latin America and the Mediterranean. For steak or a roast: blue cheese, chimichurri, horseradish cream, mushroom sauce, salsa verde. For chicken: barbecue, garlic wine, peanut, salsa verde. For fish: classic butter sauce, pesto, teriyaki, uncooked tomato sauce. For lamb: balsamic, Dijon, mint, rosemary-garlic. 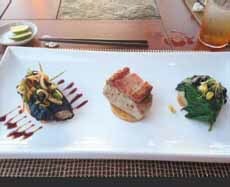 Here are how two restaurants approached the same fish:  Tuna three ways from Four Seasons Resort Punta Mita in Mexico. Tuna three ways from Michalangelo’s Piccolo Mondo in Sandton, South Africa. 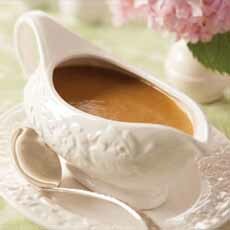 In addition to the gravy from pan drippings, serve two other sauces (photo courtesy Mackenzie Ltd.). Three flavors of mousse in mini dishes (photo courtesy Simply Quinoa | YouTube). For pork: bourbon pan sauce, caramelized onions, honey-mustard, spiced sautéed apples. For dessert: three different mini tarts, three different dessert sauces, ice cream with cubes of three different loaf cakes (e.g., banana bread, carrot cake, pound cake. Here, the cooking technique is varied: You’re cooking three different dishes instead of making three different sauces. Fish: sashimi or ceviche, grilled, poached. The “three ways” concept works for everything from humble burgers and sliders and grilled cheese sandwiches to filet mignon and lobster. To adapt what a lesson from our high school algebra teacher: the permutations and combinations extend beyond our lifetime.